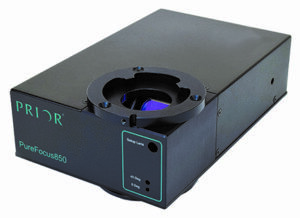 Prior Scientific is proud to announce the release of its new PureFocus850 a revolutionary autofocus for biological and industrial imaging. 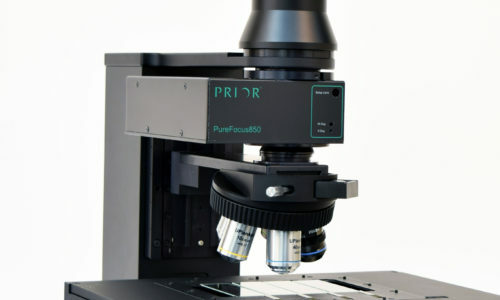 The PureFocus850 is a fast, precise and accurate focusing system that has been design to fit both upright and inverted microscopes using infinity corrected optics. The PureFocus850 is able to precisely and consistently focus on your samples when the other systems fall short. Easy to use and quick to set up the PureFocus850 will provide the end user with a real time focus for a range of sample types. This then saves the user time hunting around for focus and keeping focus on the sample, so it doesn’t drift. It is the only system to reliably focus on slides, well plates, chamber slides and Petri dishes while maintaining clear images for long term studies. Product Manager Robert Haggart says “The PureFocus850 will be revolutionary in the market and make a difference to users working processes”. A stand-alone system with no PC required during operation of the device, it is fully controllable via keyboard option, and further optional PC control can be made via USB. All of Prior’s existing products are fully compatible with the PureFocus850 allowing you to create your fully automated multi axis system. The system has an option of using the PureFocus control pad with digipot, display and buttons allowing all basic functionality without the need for a host PC.